Another record-breaking Tire Technology Expo! The 2018 Tire Technology Expo and Conference has once again set a new benchmark for the event in Hannover, Germany. With 290 exhibitors across more floor space than ever before, 700 conference delegates and more than 5,800 experts through the doors during the three days, this year’s show was the biggest yet, in every way! 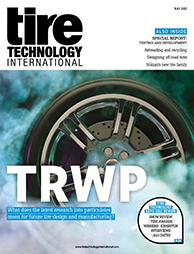 “Coming to Tire Technology Expo means we can learn about what is new, and what is ongoing in the industry – new innovations for now, and for the future. It’s important not to get left behind,” said Jani Rintala, project manager, Nokian Tyres. The world’s largest gathering of tire design, development and manufacturing experts was opened by a keynote address from Pierre Loiret of Michelin, who detailed the forthcoming world standards for tire RFID tracking – just one of many technological developments being presented by 180 speakers at the conference (another record) on subjects such as connected and smart tire technologies, sustainable materials innovations and disruptive change in the global tire industry. On the exhibition floor, product announcements included Tekna’s Vision Tire System 3D, a defect detection machine born of a four-year development project; Habasit’s downtime-reducing, timing-belt hinge joint; 4Jet’s strategic cooperation deal with LY Holding to offer laser tire mould cleaning; and Festo’s brand-new Motion Terminal VTEM pneumatics automation technology. All these companies were taking advantage of Tire Technology Expo’s highly targeted attendee base, which presents a valuable opportunity to connect with new and existing customers. At the end of Day 2, some 900 attendees enjoyed the presentation of the 2018 Tire Technology International Awards for Innovation and Excellence at a glittering gala dinner. Winners included Pirelli (Tire Manufacturer of the Year) and Goodyear, which took home the Environmental Achievement award for its soybean oil initiative. The evening further confirmed the show’s status as a fantastic networking opportunity for the tire industry. “We come every year to keep up with the technology, to follow the papers, to talk to the suppliers and the vendors that are here – it’s an extremely valuable show, and bigger this year than ever before. It’s a tremendous opportunity to see and talk to a lot of key people. There’s always something new and different at Tire Technology Expo,” said Charles Yurkovich, senior vice president, global research and development, Cooper Tire & Rubber Company. Day 2 of Tire Technology Expo 2018 continued to see guests filling the halls at Hannover’s Deutsche Messe, keen to learn more about the wide range of technologies on display. With more than 290 exhibitors in attendance, all aspects of the tire manufacturing industry are represented, and visitors were treated to the latest products, services and innovations. Over at the Tekna stand, attendees were encouraged to learn more about Vision Tire System 3D – a defect detection machine using a 10-axis, seven-camera system. A robotic arm moves the detection units according to a pre-set pattern (depending on the type of tire being inspected), and is capable of detecting defects occurring on the inside or outside of the tire. The team on the Datalogic stand were not only able to showcase their latest barcode scanning solution, but also use Tire Technology Expo 2018 as an opportunity to meet customers – existing and new – face to face. Capable of reading tires passing the sensor at 1m/s, the technology has already attracted the interest of major OEMs, and Tire Technology Expo 2018’s highly targeted attendee base presents a valuable opportunity to connect with such customers. “They are asking us general questions about how we mark these codes,” explained Vogt. “But also more specialist questions, such as if we can detect the quality of the barcodes to ensure that they can ensure that the codes on the tires are always of a certain quality. Those visiting the Intralox stand could be forgiven for believing the company had brought a video game display to Tire Technology Expo 2018. In addition, McCall also showed how Intralox’s conveyor solutions could be modelled by the company to compare and contrast different setups and technologies, but with the addition of the VR equipment to provide a new level of immersion for customers. It was a busy Day 1 of Tire Technology Expo 2018 for 4Jet, as the company announced a strategic cooperation deal with LY Holding to offer laser tire mould cleaning as a service. Day 2 saw just as much interest around the stand as 4Jet demonstrated its next-generation STMCS laser mould cleaning service. The redesigned machine is now available for mould sizes from typical passenger car to truck and bus tires. Laser cleaning doesn’t destroy the mould, mitigating the damage caused by sand blasting. It also means that fine structures increasingly seen in tire design are not removed by opting to clean using sand blasting. “The automation also means that the results are always the same,” Kraus added. For Lübeck-based SLM Solutions, Tire Technology Expo 2018 represents a chance to demonstrate the attributes of selective laser melting technology, and how 3D printing offers advantages over conventional manufacturing processes, including faster build times, greater efficiency, increased cost-effectiveness, greater flexibility and higher-quality materials. Expo visitors can also learn about the company’s latest addition to the SLM machine family, the SLM 800, which is capable of producing parts with a height of up to 800mm. Increased size, however, isn’t the only evolution of the technology. “Larger is one way [the technology can evolve], but we also try to increase the quality of the parts, the surface quality, and reduce the build time,” explained SLM Solutions application engineer Niels Bendig.